Next is the Signs You’re Having twins by a blood test called “Serum beta subunit hCG quantitative“. Having twins? Beta hCG Levels Twins Chart Exclusively explained for pregnant women. HCG levels is a Good sign to expect if you’re having twins, triplet, or any multiplet. Human Chorionic Gonadotrophin Hormone (hCG) is a unique pregnancy hormone. It is the hormone which is detected early in the blood and/or urine of a woman who is pregnant. Next is valuable detailed data to help you calculate hcg levels for twins. • Increased likelihood of having more than one child when taking fertility treatment, such as in in vitro fertilization (IVF). • Older Women which have hormonal changes lead to releasing more than one egg at a time. • Family history, certain lifestyle, and specific locations; are all proposed to have more chances of having multiple pregnancy. • Gestational weeks, e.g. 3 weeks after beginning of menses = 3 weeks from last menstrual period (LMP) = 1 week after ovulation (DPO) = 1 week before period is due, in a standard 28-day cycle period. • Women have more or less period length must look for their hCG values in the tables. • HCG Triplet Pregnancy chart has less hCG values than twins chart which clearly is due to low number of women reported their hCG test result in this study. • Also the results in the tables can be applied to either high hcg levels after ivf and normal hcg levels for ivf pregnancy. How to calculate Ovulation by yourself? What signs you’re having twins? What does it mean when your hcg levels are high, does it means you’re having twins, may be yes, maybe not, just compare your results with values reported in the tables and read my interpretation to know how to expect your pregnancy as close as possible? Doubling of pregnancy hormone: pregnancy hormone levels (HCG) doubling is an average that is not correct for every woman. HCG level should rise by at least 60% in 48 hours, or rapidly increasing hCG levels can be a good sign but not accurate as well, also the molar pregnancy can be mistaken too. A study said: you are more likely to have twins if your hcg was 600 or higher at 16dpo. But It’s correlated with multiples pregnancy not definitive. In the tables below: women who are having a multiple pregnancy, twins pregnancy or more it is common for their hCG levels to be 30-50% higher than those with a singleton pregnancy. 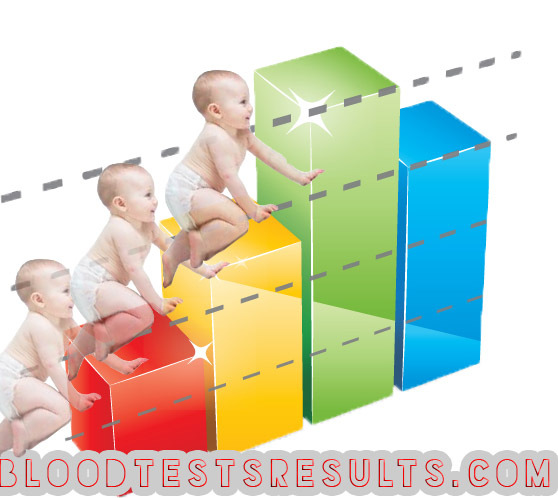 Continue with explaining hCG levels week by week for better understanding how can HCG indicate twins? 3 weeks LMP corresponding to 1 week Post Ovulation or 7 Days past ovulation. Low number of women reporting hCG results at this early stage. Low average hormone levels for both singlet and multiplet pregnancy. Many women don’t even know that they preggo. For better calculation: in standard 28 days cycle 4 weeks LMP corresponding to 2 weeks Post Ovulation or 14 Days past ovulation. The Highest reported hCG values during 4 weeks twins pregnancy are higher 5 times then hCG values reported in the same period when the woman carry a single baby instead. Also the 4 weeks’ average hCG levels is 129 miu/l for singleton, while twins average hCG value is 235 miu/l. How to Expect Having Twins at 4 weeks LMP or 14 DPO? Simply, if your hCG levels at 4 weeks is higher than 8000 miu/l then it’s likely you’r having twins, or if the levels are 5 times higher than your previous singleton baby. In standard 5 weeks LMP corresponding to 3 weeks Post Ovulation or 21 Days post ovulation. The most lower normal hCG value after 5 weeks LMP/21 dpo is 61 miu/l during carring single baby, while hCG go as low as 106 if woman carry twins, which considered normal. The highest value of hCG hormone after 21 days post ovulation is up to 19726 miu/l during singleton, while 20956 miu/l is the highest pregnancy hormone result for twins after the same period i.e. 5 weeks LMP/21 dpo. The average hCG level for singleton is 1721, while average twins hCG value is 3446 miu/l. Although, you can’t expect twins just because your hCG Blood test result is above the average i.e. 3400 at 5 weeks LMP, while hCG 20000 or higher at 5 weeks have the highest chance of having twins. For instance: A woman B-HCG level at 4w 1d was 109.8 and at 4w 3d it rose to 190 but when rechecked at 5w 4d and hcg level had risen to 5,257. HCG levels at 6 weeks pregnant can be as low as 245 and could be up to 81000 miu/l at 6 weeks LMP/ 28DPO, which is the highest reported value for hCG hormone for singleton pregnancy in this study. hcg levels for twins 6 weeks LMP/28DPO has the lowest value of 373 miu/l, while the highest hCG hormone value after 6 weeks gestation is 203398 miu/l for twins babies. The Average pregnancy hormone test result after 6 weeks of gestational age is 11073 for singleton, and 23323 miu/l for twins. You’re having twins surely if your hCG level after 28 days post ovulation is more than 90000 miu/l, while more than the average hcg 23000 is not a sharp sign after 6 weeks. By understanding the previous explanations, it is easy to expect hcg level at 7 weeks with twins, hcg levels at 8 weeks with twins, or HCG for 10 weeks pregnant with twins. Ask your Doctor to test your progesterone level or triple test for best pregnancy prognosis. Schedule an early scan at 7 weeks. Along with scan results, and you’ve got your hCG calculator, it’ll be easy to expect twins. Just keep you away from stress and Calculate days carefully to get better results. AMH levels can help in expecting Ovarian reserve, and IVF chances which may help reduce abortion, don’t miss. Explaining the minimum and the maximum values seen after every day past ovulation, level ranges for singleton and multiples pregnancies are not widely different. Have this interpretation helped you? Hi,I just hit six weeks last friday. I found out today that my hCG levels were 122,041. Is it possible im having twins? My HCG levels at 7 weeks pregnant were 80,372. What does this mean? Hi my levels are 38719 im 5 weeks and wondering if im having twins?